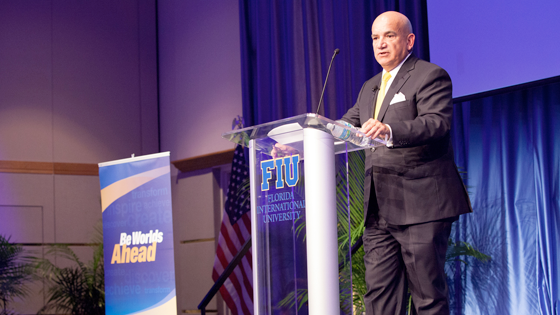 The FIU Center for Leadership is pleased to present the Miami Leadership Dialogue, "Healthcare at the Crossroads: A Conversation with Carlos A. Migoya." The Fall 2013 edition is hosted by FIU President Emeritus Modesto A. Maidique, and Executive Dean of the FIU College of Medicine, Dr. John Rock. Carlos A. Migoya has served as President and CEO of Jackson Health System since May 2011, overseeing one of the nation's largest and most respected public healthcare networks. Jackson has the distinction of bringing world-class medical care -including the medical school faculty and students from the University of Miami and Florida International University-to a taxpayer-owned system that guarantees a single high standard of care for all residents of Miami-Dade County. In his first year at Jackson, Mr. Migoya led a transformation that reversed years of massive losses and produced a small surplus for the first time in recent history. At the same time, key indicators of healthcare quality and patient satisfaction improved, proving that public hospital systems need not choose between medical excellence and operational sustainability. Prior to joining Jackson, Mr. Migoya spent more than 40 years in the banking industry before volunteering for a year as City Manager in Miami, successfully tackling the city's ailing budget issues. Mr. Migoya earned an undergraduate degree in finance and a Master of Business Administration in finance from Florida International University.